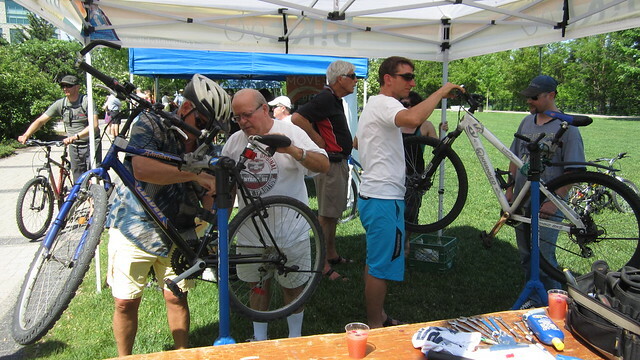 The area in and around Millennium Park and the Silver Bean Café was a busy place Friday afternoon as they played the host for the “Bike and Trails Fest”: an event that saw the end of the May Peterborough Shifting Gears Workplace Challenge and the lead in to the Second Annual International Trails Day. 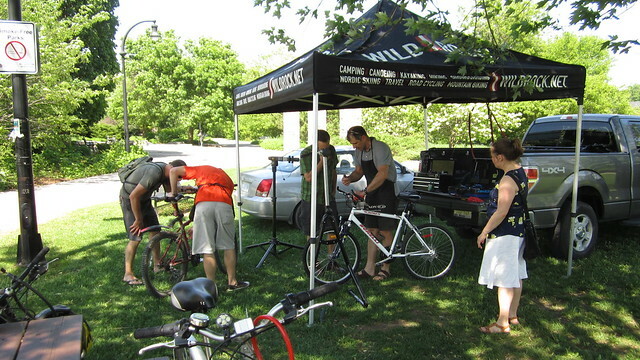 With the wrap up of the month-long Shifting Gears Workplace Challenge and nearly a dozen events cued up for International Trails Day on Saturday, it was easy to stage a bit of a celebration of all things trails down by the river as several different groups came together to recognize the place that trails have taken in the modern urban-rural landscape. 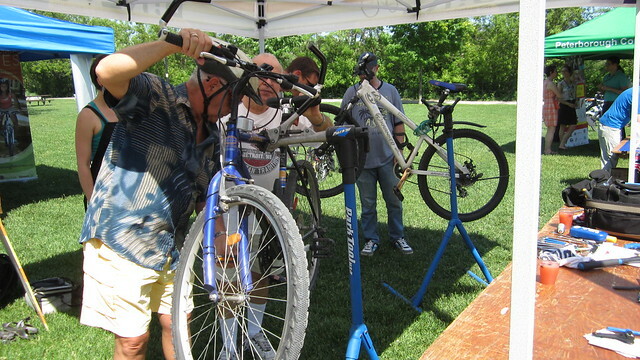 Naturally, cycling was a key element of the event. 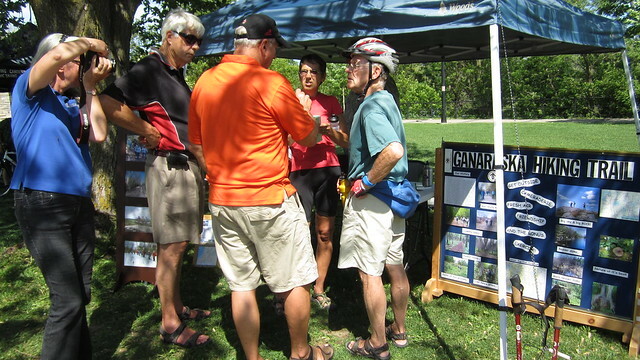 Folks came to discover information about the many trails in and around the city, find out what events were on for Saturday and get better connected to the many ways people can move around the City and County without having to rely on cars. What was notable from the crowd was the many seniors who were there; eager to find out more about the alternatives to car-centric transportation. 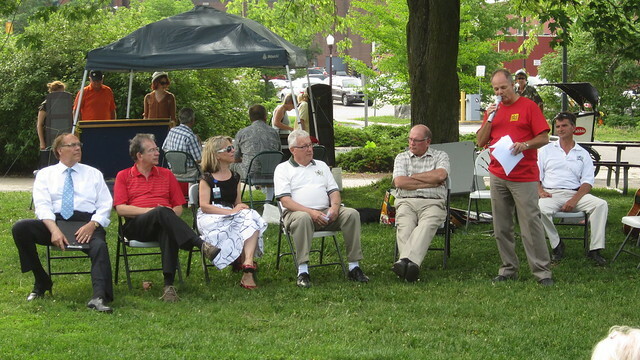 Representatives of the Province, the City, the County and its townships as well as our Medical Officer of Health were on hand to recognize the social, economic and environmental benefits if trails and help announce Trails Day. Through speeches from Jeff Leal, our Minister of Rural Affairs, through the City Mayor, Daryl Bennett, and on to our County representatives, the message that trails are important to the economic, physical and mental health of the people of our region was made very clear. 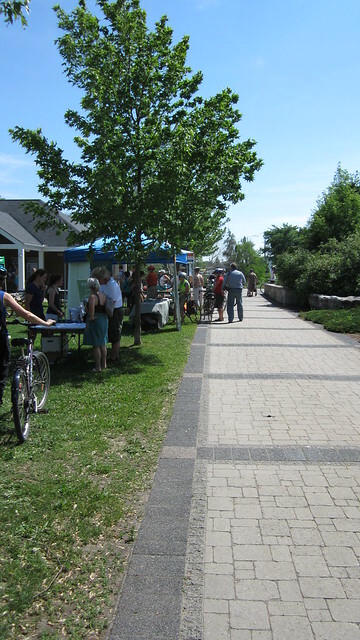 While the wind made its presence known, the rain stayed away and, through one sunny afternoon down by the river, people got a better sense of how our trails connect us all. 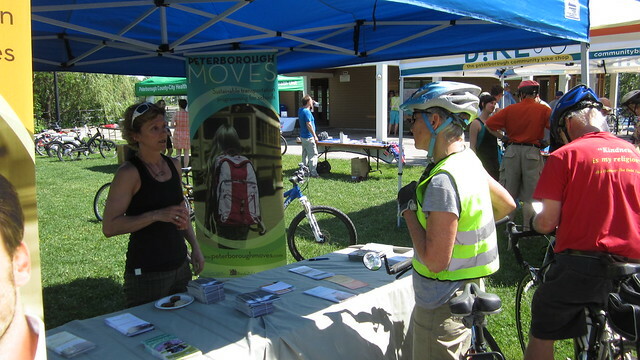 Discussing cycling in Peterborough at the Peterborough Moves booth. 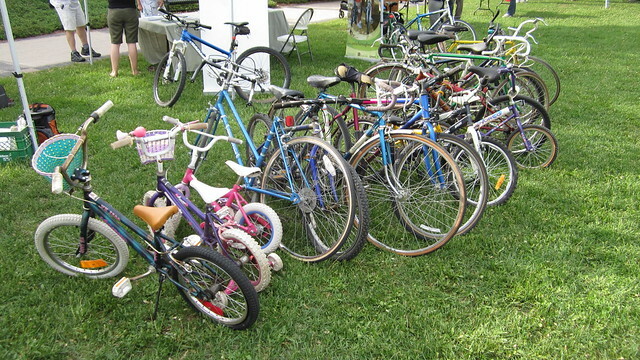 A good number of bikes donated to the B!ke Bike Drive donation plan. Of course, one of the results of the donation campaign is lots of steel. This donated Peugeot created a number of comments towards the end of the afternoon. 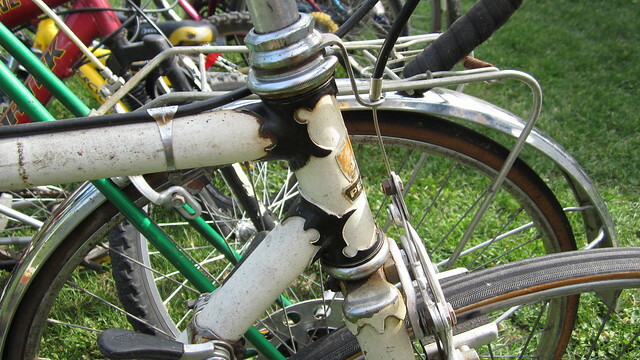 Which leaves the question, is “lug lust” a defined disorder under DSM-5? 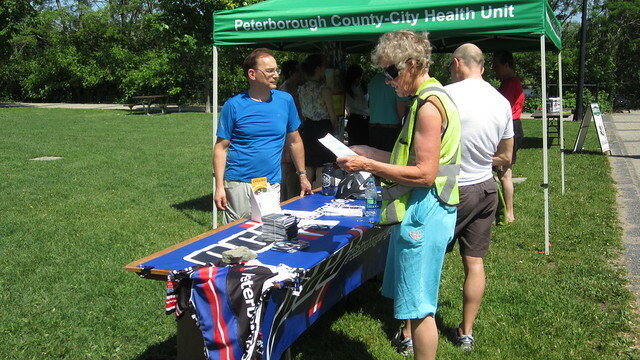 See, also, coverage and more pictures at The Peterborough Examiner. A great event for Ptbo. AND I got a much-needed handlebar adjustment. Thank you!